The best gaming speakers are not only going to get those skills on another level, but also elevate your game experience as a whole with better sound quality, more power, and a pleasing look with your setup on top of it all. 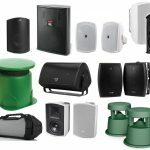 We’ve gamed with numerous types of speakers out there, whether they’re professional music studio monitors, simple little speakers we bought for super cheap, or something in the middle. 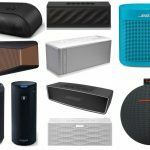 If you aren’t into gaming with a headset or at least need a break here and there from them, we found the top 10 best speakers for gaming to give you some options in finding the best for you. But first, let’s look into a few factors we want you to keep in mind when searching. 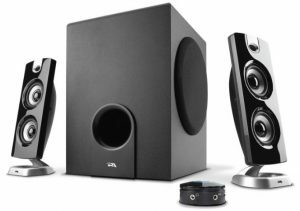 Your budget – We’ve seen quite a price-range when it comes to speakers in general, let alone models geared towards gaming. 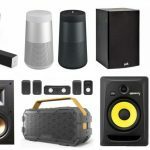 Although we were able to find different models with different price-tags below to give you options, the best gaming speakers for you will be limited or allowed by how much cash you have at hand. There are some affordable models even under $50, while others if you can spend a few hundred dollars will give you top-notch quality. If it’s a debate for you whether or not you should save up after finding speakers you like, we always praise patience when it comes down to it. Especially if you’re playing an FPS and need to hear your opponents clearly and loudly, the better your speakers are, the better your skills and edge you can attain against them. To explain our first (and preferred type), they’re entitled ‘studio monitors’. Although some may associate these with ‘studios’ for music, that ‘monitor’ word tells us one thing — accuracy. Most have built-in tweeters and subwoofers with extra components to portray the accuracy of their sound source to the listener. For gaming, this can help for numerous reasons, such as being given the experience the game creator wanted us to have, it can allow us to hear our opponents or necessary FX from our team to play optimally, as well as give us some nice speakers overall to listen to music, TV shows or movies (or even make music if you do so) after we game. 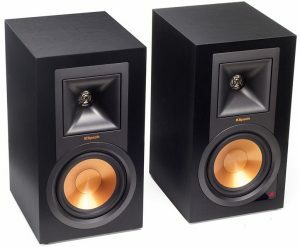 However, some may notice that studio monitors don’t have external subwoofers, which may be something you’re akin to. We’ve heard many state that additional subwoofers aren’t necessary with studio monitors since there are technically mini subwoofers built-in to the speakers themselves and that external subs could cause some bass overload and be ‘too much’. 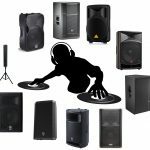 Others however crave those sound effects and want as much as bass as possible, so if you like a pair of studio monitors and want to also buy an external subwoofer, be our guest (they sell them separately) if you want some extra thud in your explosions or shots. Next, we’ll talk more of a ‘traditional’ computer or TV speaker system. 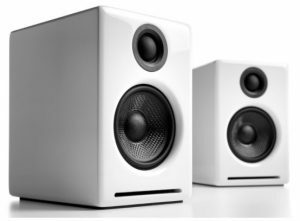 Also known as ‘2.1 speakers’, the 2 means speakers, while that 1 explains the subwoofer. Therefore, there are technically 3 types of speakers included in the package (as well as some with a receiver). These can be also give us amazing quality and be quite effective for gaming, regardless of what system you’re on. 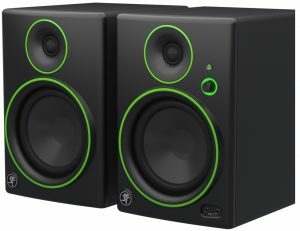 They can also be found for a bit cheaper than studio monitors, so that could deter you in this direction as well. Where do you game? 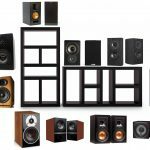 This is something to keep in mind in case you have to foresee where you’ll not only be fitting your speakers, but making sure what you’re buying will have the necessary ins\outs and ports. Are you hooking up to a TV? PC? Laptop? Mac? A mobile device? All of the above? 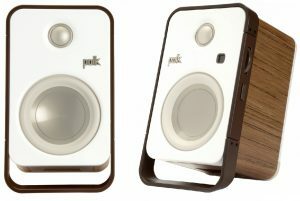 Extra speaker features – Want some Bluetooth to stream some music after from your smart device? Portability to travel? Small and sleek size to fit on your desk? A soundbar system instead of traditional speakers? Higher-end finishes with wood or steel material? Keep these smaller features in mind in case you need to narrow down your search further. To kick off our list, The R-15PM by Klipsch, a pretty high-end brand, represents a simplified approach to enjoying your speaker system. This Bluetooth technology based speaker is powered by monitors that generate amplified sound at an incredible level. 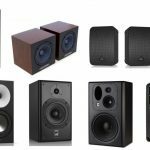 We start our list off with a more traditional pair of monitor speakers without an external subwoofer mainly due to their quality and overall versatility — if you do want a subwoofer (there is one built-in to each speaker of course), they sell a correlating model that’ll sit alongside these but that’s going to cost you more money if you have the budget. In terms of build, each monitor comes with 1 inch aluminum diaphragm compression driver alongside a woofer that’s magnetically shield (5.25″ copper spun). In addition, you also have 1 pair of RCA phono level inputs with the ability to switch over to a phono/line input if you aren’t feeling Bluetooth and want a direct connection. These can connect to TV’s, computers, turntables and more all with a simple setup and no receiver needed — one of the reasons this is first is because it’ll fit for readers of all types of gaming settings. There’s not much else to say about the R-15PM other than it is what we feel one of the best gaming speakers on the market when it comes to build and sound quality. If you’re looking for surround sound while enjoying your video game experience and truly want to feel like you’re inside the game, let the Klipsch R-15PM take you away because there just isn’t anything else quite like it. We just hope your budget allows the buy. Here we have yet another one of the gaming speakers in the monitor category, but this time more affordable if you weren’t feeling our previous pick. The CR3 offers a speaker that is equivalent in quality to anything else like it and at a discounted rate. You have great features such as a very wide frequency range at 80 Hz to 20 kHz, easy-access volume knob, front-facing headphone jack in case you’d like to switch over, all-wood cabinet for a natural sonic character sound, as well as 50 watts of power, 3″ woofers and .75″ silk-dome tweeters built-in to each speaker. You also have quite a few accessories included in the box — acoustic pads for isolation and tilt control, 1/8″ to stereo RCA connector (to go to your computer), 1/8″ to 1/8″ cable for smart phones, and a speaker-to-speaker cable. As you can see, the specs and features aren’t necessarily as eye-popping as our previous pick, but you’re getting a cheaper price for a solid build and quality while at the same time going pretty easy on the wallet. Their whole CR monitor series is famous at this point. This is the ideal speaker for home studios, multimedia creation as well as for you games in either the office or living room on a TV. The Mackie CR3 is a high-tech speaker that comes as a simplified user-friendly set up, and at a great price. 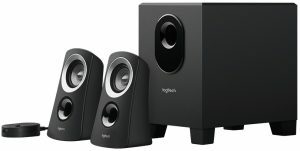 The Logitech Z313 is first in its class when it comes to the best speakers for gaming at a low price-point. Now we start to get into the 2.1 speaker setup if that’s what you were interested in. There is not much to complain about this system considering how affordable it is, and this one offers not only two decent-sized speakers but a compact subwoofer as well that will without a doubt distribute the perfect balance of acoustics as well as an intensified bass. This speaker is capable of full range audio that also allows you to connect to nearly any device through its 3.5 mm input, and will provide instant access to its power and volume with its customized wired control pod. You’re not getting Bluetooth or a fancy tweeter and subwoofer built-in to the speakers but with the price we understand why — it’ll still get the job done for gamers of all types. What we really like is the enhanced bass because it brings a great audio experience through its subwoofer that is conspicuously smaller in size — just set it on the ground or elevated a little bit (to be safe) you’re good to go. We only recommend this one for PC setups. however if you take gaming seriously and want to make your experience as enjoyable as possible, the Logitech Z313 is one of the best gaming speakers in the market in its price-range. We’re actually using these right now and have had them for 10 years — they still work amazingly. Genius offers a new look to gaming speakers in its SW-G2.1 2000, backing up its claim as one of the best speakers for gaming with many user reviews around the net. Custom designed to fit your PC, Laptop, Android, Apple TV or tablet, this speaker is equipped with so many great features your gaming experience will never sound so sweet. Offered with 45 watts (RMS) in output power, this is certainly a powerful choice to amplify your gaming sound. 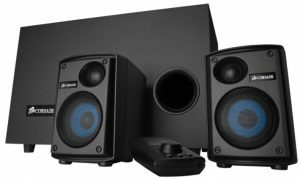 This relatively compact speaker system comes with dual input jacks to meet the needs of each of your PC, TV, DVD, and or gaming devices. The adjustable volume and Bass controls are added for convenience so that you can have easy access to adjusting the level of sound. You also have multiple inputs with RCA and 3.5 mm. There is not much to complain about in this Genius SW-G2.1 2000 speaker system as it not only offers a high-quality sound for your gaming experience, but also offers headphone jacks if you would rather not disturb others or enjoy your game in solidarity. Plus that look is super awesome don’ you think, that blue LED is pretty aesthetic. This is a nice 2000 review for some more info. The Razer Leviathan enables the speaker experience to not only be enjoyed by gamers, but also for movie lovers as well. This multi-purpose speaker system looks like the traditional soundbar for TV systems, but also features every necessity needed for the best all-around gaming surround sound experience. Enjoy unparalleled gaming sound when you are the heat of battle so that you actually feel like you are really there. This system offers an incredibly realistic experience that comes with a powerful 5.25 downward firing subwoofer so that you can enjoy the sweet beat of the bass in the best possible way. This system has a surround PC gaming sound bar, making it one of the best gaming speakers, especially for war video games, but any setting or application will be fine. Designed for enhanced sound clarity this speaker is equipped with Dolby technology, as well as virtual surround sound technology enabling you to have the ability to hear every minute detail. Razer is synonymous with gaming gear. If you are looking to enhance your gaming sound and just overall improved gaming experience, the Razer Leviathan is a great place to start if you see it fitting into your current setup. You’re getting Bluetooth connectivity, too. Audioengine has come out with another appreciable speaker system that not only comes with improved durability but also with additional mobility for on the go gaming. Equipped with built-in digital-to-analog converter technology, this gaming speaker enables the user to distribute an even higher-quality digital audio straight to your computer. Simply plug and send using the USB port. Left and right speakers are included in this speaker package as pair allowing you to have convenient accessibility to both speakers right from the get go. An added output is offered to connect a subwoofer if you please and you can purchase their W3 adapter to allow you to have a wireless experience for added versatility. With the Audioengine A2+ your gaming experience will instantaneously improve because you are now able to have the gaming sound that needed for realistic game play. Whether you are fighting crime or playing professional sports, this is a guaranteed high-quality audio and also a great addition for your computer or tablet. 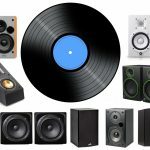 It’s versatility is also great to standalone as a computer speaker for music listening or watching some shows on Netflix as well. Designed to offer an enhanced sound regardless of what’s playing, the Cyber Acoustics brings your game to life with an extremely budget-friendly 2.1 speaker system. This speaker offers two slim and sleek speakers and powerful subwoofer for bass performance that is a great combination for high energy gaming, making it one of the best gaming speakers to date if you wanted to save as much dough as possible. The adjustable volume allows the subwoofer and bass sound to be adjusted upward and downward to your preference. Whether you are one who enjoys a mellow environment or one that enjoys a loud vibrating sound system while gaming, the CA-3602 speaker system that offers great adjustability it is meant for just about any experience possible. Convenient desktop controls offer master volume, headphone output jacks, auxiliary inputs and bass volume controls making it one of the best speaker for gaming. This is a 2.1 speaker system that brings powerful sounds to your ears if that’s the option you are seeking in your gaming experience. Incredibly audible and equipped with an LED power indicator, there is no selling the Cyber Acoustics CA-3602 gaming speaker short when it comes to constraining the optimal features for such a low price. Inspiring and innovative, the T12 is the clear-cut favorite when it comes to simple desktop speakers for an affordable price. Built for high-quality and fine-tuned for clarity, this is one of the best gaming speakers if you were in need of simplicity yet effectiveness. Whether you enjoy playing your games on the television screen or on the computer, this speaker offers BassFlex technology that will extend your low frequencies so that you can absorb minor details of your sound. Perfect for your at-home gaming set up, this is a speaker that is considered by the those who prefer sleek looks with its jet-black color, not to mention it’s conveniently located built-in headphone jack and auxiliary-In connector. This is a simplistic speaker system that is a great choice for enjoying music on a smart device as well as for intensifying your gaming adventures. 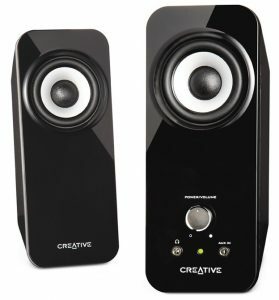 This speaker full range drivers will bring to life whatever is being listened to, so don’t think too hard on this one because the Creative Inspire T12 is hard to beat if you don’t want to mess with a subwoofer and don’t care too much about bass. Designed to amplify your sound and bring your listening experience to new levels of enjoyment, the Polk Audio Hampden are quite rare right now but are powerful desktop speakers that come with every great feature that you look for in a speaker. The Hampden’s USB input is offered by Polk Audio (they’re a pretty high-end brand) so that you can skip right pass the lower quality digital-to-analog converter. 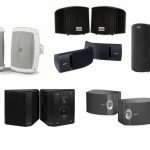 Enjoy you sound from any digital source that you want, as this speaker system offers a higher quality converter which really is its differentiating factor. This speaker brings to life all of your sounds with its 4-channel amplifier, as well as its Digital Signal Processor for optimal sound frequencies. Bluetooth is growing in popularity among video game speakers if you don’t mind a little delay, and the Hampden is no exception, making this one of the best speaker for gaming if you like luxurious electronics. Not only is this a trendy speaker in terms of looks, but the Polk Audio Hampden offers optimized sound quality and a smoother listen for your ears. The availability is pretty limited as of now if you can find it on the internet for a decent price. Up last, but certainly not least (it’s a little difficult to find at the moment), the power is yours when it comes to the SP2500. With this versatile gaming speaker system, you can now enjoy video games, movies, and music at whatever volume you desire with its adjustability features, while still sustaining high quality sounds regardless of its noise level. Analog speaker systems will never be compared again, as this speaker comes with digital signal processors as well as digital crossovers for a higher quality processing that brings the optimal sound to your ears. A big standout of this one however is the control audio hub — it comes with a PC input, two additional audio ins, and a headphone connector while at the same time allowing you to control the volume with a large knob in the center. Even better is a large 1.8″ TFT display with a menu to enable Mod X audio processing, select through dynamic DSP programs, and custom EQ curves — not musts at all, but if you’re into a custom sound this could be the one for you. The sound quality and sophistication of this model is what makes the Corsair SP2500 one of the best speakers for gaming. The speaker’s overall control, build, digital amplifiers as well as it’s 3-inch driver makes this a can’t miss speaker that will certainly be hard to beat if you want a 2.1 speaker system.